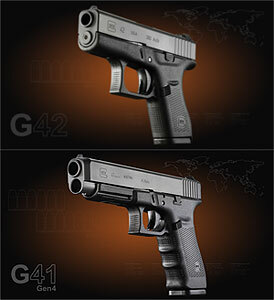 The new Glock 41 and Glock 42 that were recently revealed at the 2014 Shot Show are nice if not strange additions to Glock's current handgun lineup. If you haven't heard the news let us be the first to tell you about these 2 new tools. The Glock 42 chambered in 380 auto is the most interesting of the 2 in my opinion. It is as far as I am aware the first single stack pistol that Glock has ever mass produced. Because it's single stacked it means it's thinner and has a width of just .94 in. To put this in perspective the Glock 17 probably the most widely used handgun in the world, has a width of 1.18 in. Other notable features on the Glock 42 are that it weight just 13.76 oz unloaded, has a capacity of just 6 +1, and a length of just 5.94 in. The Glock 42 will be in direct competition with the Ruger LCP (380 acp), Walther PPK (380 acp), Taurus 738 (380 acp), Keltec P-3AT (380 acp), Kahr P380 (380 acp), and the Kahr P380. So with so many options why would someone choose the Glock over say the Ruger LCP? 4 words...Aggressive, Marketing, Reliability, Simplicity. The Glock looks like a Glock so it's a bit more aggressive looking than the LCP. Glock's marketing is legendary, just like it's reliability. Glock's are simple to use take down and clean. The Glock 41 chambered in 45 ACP. "Taken from Glock The GLOCK 41 Gen4 is a practical/tactical .45 AUTO caliber pistol designed with the superior engineering of GLOCK to maximize sight radius while improving weight distribution and balance. The longer barrel and slide help to reduce muzzle flip and felt recoil while the longer sight radius provides better accuracy for competition or duty use." So basically the Glock 41 should handle and shoot better.